Tap the Mail button on the Home screen. Notice that an Unread mailbox was added. Tap the inbox for the account you want to send the message from. Tap the Compose button in the lower right corner of the screen. A New Message screen opens. The cursor is blinking in the To field. 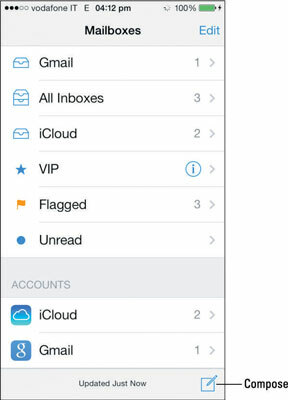 You can tap the Compose button in the lower right corner of the Mailboxes screen. The message will be sent from the default mailbox you establish in Settings→Mail. In the To field, type the e-mail address of the person you want to send the message to. As you begin typing the recipient’s name in the To field, names of people in Contacts or people with whom you recently (or not so recently) exchanged e-mail that contain the same letters show up as a list from which you can choose. Your choices narrow as you type more letters. The e-mail address is listed under the contact’s name and if a contact has more than one e-mail address, his name is listed with each address and the type of address appears to the left. Entries with an info button next to them are e-mail addresses that you received messages from or sent to but who aren’t in your Contacts. Tap the arrow to show the Recent screen. From here you can create a new contact, add the e-mail address to an existing contact, or delete the entry from the Recent history — tap the button for the task you want to do. When you find the name you want, tap it. If you want to add another recipient, repeat the previous step. 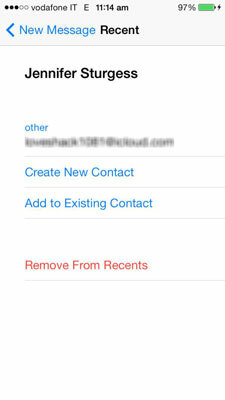 To open Contacts and choose the recipients from there, tap the plus sign button on the right of the To field. Contacts opens. Scroll through the list and tap the names of the desired recipients. 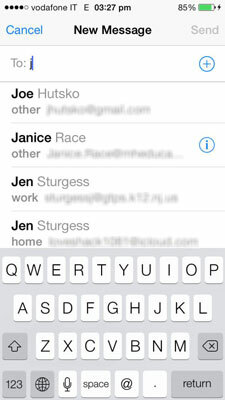 You can access all your contacts or just specific groups by tapping the Groups button. 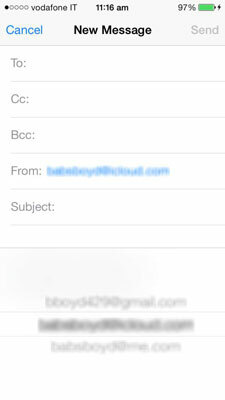 If you want to send a Cc — Carbon Copy, or Bcc — Blind Carbon Copy, to other recipients, tap the Cc/Bcc field. The field expands into three fields: Cc, Bcc, and From. Fill in the Cc and/or Bcc fields the same way you fill in the To field. If you want to change the address from which the message is sent, tap the From field and choose the account you wish the message to be sent from. When you finish addressing the message, tap Return. The cursor moves to the Subject field. You can move names from one address field to another, such as from To to Bcc, by touching and dragging them where you want. Type the subject of the message, and then tap Return or tap directly in the message field. The cursor moves to the message field. Type your message and then edit it. Tap the Cut, Copy, or Paste buttons if you want to perform those editing actions on your text. Tap the arrows on the right or left ends of the button bar to see more options. Select just one word, and tap Replace to see a list of alternate spelling corrections or tap Define to see a definition. Tap BIU to open a button bar with bold, italic, and underline options, which you tap to format the selected text. 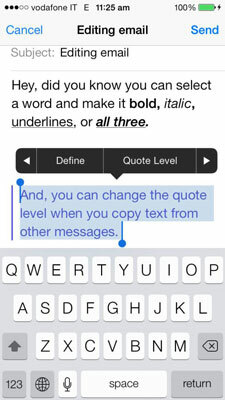 Tap Quote Level to open a button bar that offers an increase (indent) or decrease (outdent) option. Tap the one you want to use. Tap Insert Photo or Video to open the Photos app and choose an image or video to attach to your message. Repeat the process to apply more than one formatting option to the same text or to remove the format. The word Sending appears at the bottom of the screen, and then a blue sending progress bar opens. Faster than you can put a stamp on an envelope, your message is on its way. If you’ve turned on the Sent Mail alert under Settings→Sounds, the sound you chose confirms your message has been sent. If you’re composing a message and have to stop midway, you can save it as a draft. Tap Cancel in the upper left corner, and then tap Save Draft from the buttons that appear on screen. The message goes into your Drafts inbox to be opened later and modified. Tap Delete Draft if you wish to eliminate the message or Cancel to return to the message and continue writing. Tap and hold the New Message button to see a list of Drafts waiting to be completed. Siri is happy to read as well as compose and send e-mail messages (as long as you use an iPhone 4s or later, Siri is turned on, and you have an adequately robust Internet connection). Press and hold the Home button or bring your iPhone up to your ear and tell Siri who you want to send a message to, and then start dictating. Unfortunately, Siri can’t read your messages to you — yet.